STARS Salutes the Silver Screen, the spring concert of the Soo Theatre Arts Resource Studios dance department, will be presented Friday and Saturday May 18 and 19, 7 pm. at the LSSU Fine Arts Center. General admission tickets are $10 each and are available at the STARS office and the LSSU Norris Center box office. The dance concert will feature 150 dance students, ages 3 through adult, under the direction of Dianna George. Special guest stars performing on this program will be Gregory George and members of the Children’s Ballet Theatre of Michigan. Also performing will be soprano Karen Hughes and the STARS Youth Orchestra. Classical ballet, jazz, modern, contemporary ballet, tap and ballroom dancers will move to the great movie themes through the years. The show will be professionally videotaped by Picture This Productions (Jane Duffield, videographer). DVDs will be available for $20. You may order your copy now through Tuesday, May 22, at the STARS office or in the lobby on the evenings of the show. Orders must be accompanied by payment. Sponsors Needed For Our Summer Season! The Soo Theatre Project continues to have an artistic impact on Sault Ste. Marie like no other. It is best seen downtown with storefront renovations that have changed the face of our small town. Music and dance classes with renowned faculty, artistic, and live performances are all a part of what is happening with our stately old theatre. Unique to the Soo Theatre Project is the fact that while work continues, the shows will go on! The summer begins with a special presentation of Mozart's The Magic Flute and includes a full musical production of Annie with over 60 local artists and orchestra. The Soo Theatre Project has begun to enhance the cultural health of our area, with dance lessons, instrumental education, art projects, and world class entertainment. The participation and financial support of hundreds of volunteers has helped the project move forward in swift fashion. A unique opportunity now exists for you to participate with a seasonal sponsorship. The Soo Theatre Project is a non-profit organization and relies on the community's financial support with your tax-deductible donations. Attractive as this aspect is, there is much more! For instance, a $1000 seasonal sponsorship will yield a full-page ad in all entertainment programs, a presence on the lobby signage, and a pair of season tickets! You will also be able to take pride in the knowledge that you are supporting one of the most important and vital projects in the history of the area. For details on how you can become a sponsor, see the flyer on our website. Be a part of the shaping of our future...good for you, good for the Soo! Take a Class at STARS This Summer! 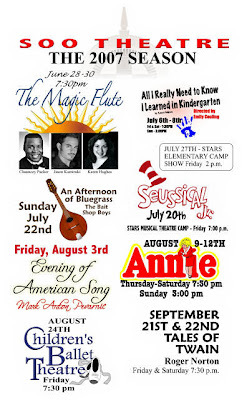 Get ready for some more fun this summer at the Soo Theatre! Registration for STARS summer classes begins Tuesday, May 1. Register in person weekdays 10-6. A class schedule and more details are available online. Soo Theatre Arts Resource Studios (STARS) presents the STARS Youth Orchestra and Vocal Classes in Concert at 7 p.m on Saturday, May 12, at First Church of Christ, 300 W. Spruce St., Sault, Michigan. The concert will also feature the Fifth Grade Orchestra of JKL Bahweting School. Donations will be accepted at the door to benefit the STARS Scholarship Fund. The Middle School Vocal Techniques class will open the program with selections from “The Sound of Music.” They will join with the Young Singer class to perform the musical “The Little Train,” based on “The Little Engine That Could” by Watty Piper. These students are under the direction of Karen Hughes. The STARS Youth Orchestra, under the direction of Dottie Case, will present a program of popular movie themes and traditional fiddle tunes. Special guests, the Fifth Grade Orchestra of JKL Bahweting School, will perform “Iowa Spring”, and then join the Youth Orchestra in a combined piece, “Celtica” with violin soloist, Matthew Wilkinson. Music students from the Soo Theatre Arts Resource Studios (STARS) will perform in recital Friday, May 4, at 7 p.m. and Saturday, May 12, at 2 p.m. at Central United Methodist Church, 111 E. Spruce St., Sault Ste. Marie, Michigan. A free-will offering will be accepted at the door to benefit the STARS Scholarship Fund. Musicians, ages 4 through adult, will present piano, violin, viola, cello, recorder, voice, and harp solos and duets. These performers study privately with Dottie Case, Karen Hughes, Ronda McGreevy, Jennifer Parker, and Nancy Powers at STARS. For more information, contact the STARS office at 632-1930. STARS is a program of Soo Theatre Project, Inc.